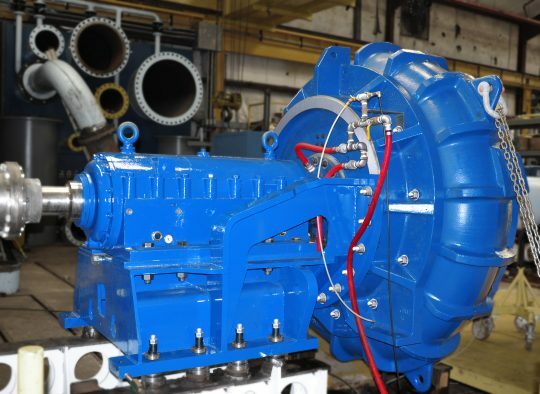 If you’ve ever had a question about a GIW pump, chances are the “Slurry Pump Oracle” has come to your aid. Here at GIW Industries Inc. we’re proud to employ a whole roster of individuals who have dedicated their careers to making our company as customer-oriented and innovative as possible — and Senior Product Manager Ronnie Willis is at the top of that list. Ronnie is a Senior GIW Product Manager and is well-versed in all GIW pumps. His particular product lines are the TBC and WBC. He also works with new materials such as Endurasite™ and Enduraclad™ as well as custom oil sands products. Here he stands next to the WBC Expeller pump. With more than 40 years of GIW service under his belt, Mr. Willis has been hands-on in helping customers select, develop, and maintain their pumping equipment. Today, he focuses his expertise mostly in the oil sands and phosphate industries, but Mr. Willis spent decades working on engineered solutions for countless slurry pumping problems. In fact, he’s so well-versed in everything GIW that his colleagues gave him his much-deserved moniker. However modest he may be about receiving recognition for his expertise, Mr. Willis is certainly more than willing to give extra attention to those who need it most — GIW’s customers. With such varied pumping applications and environments, customers often come to GIW with unique needs. 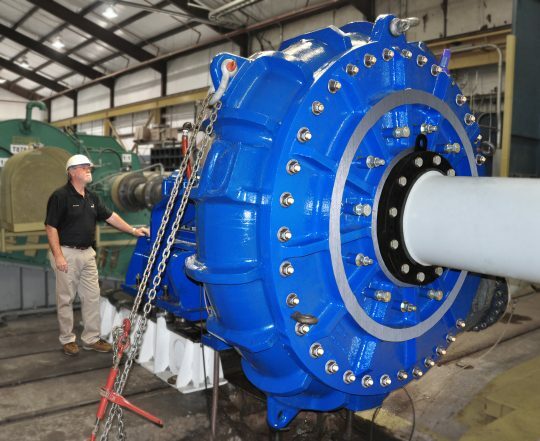 The key to making their slurry operations as efficient as possible could be anything from a simple liner adjustment to a more complex system modification, and Mr. Willis always finds a way to make it work. And if his name sounds familiar, it could be because Mr. Willis has shared his expertise in past issues of The Flowsheet. In fact, Mr. Willis personally recalled one phosphate industry customer who was actually breaking pumps on startup and another in the oil sands who requested an impressive 6,000 hours of wear life from their pump. He helped find answers to both costly issues, saving the customers a tremendous amount of money and downtime. Mr. Willis knows GIW pumps inside and out, particularly the WBC and TBC lines. He also works with new GIW-developed materials Endurasite™ and Enduraclad™, so in collaboration with his team, the potential for developing custom solutions are virtually endless. Yet it’s more than just his breadth of pumping knowledge that make the Slurry Pump Oracle such a valuable person to GIW and our customers. It’s his entire demeanor: He’s honest, helpful, hard-working, and kind. GIW shares that sentiment in return. The Slurry Pump Oracle is just the sort of individual we are proud to have standing alongside our products and guiding our customers to success!